Mountfitchet Castle is a national Historic Monument, protected by the Department of the Environment. 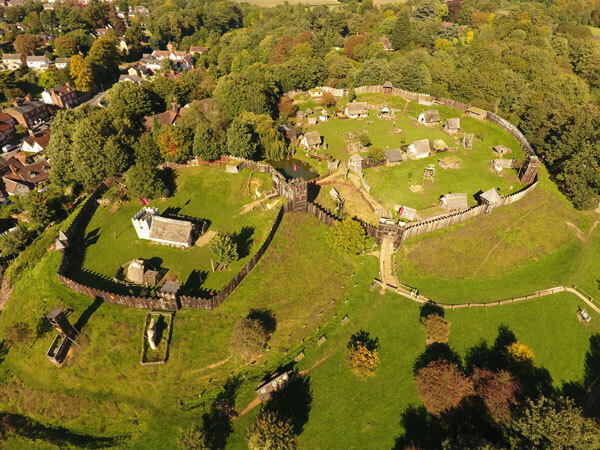 It is believed to have been an early Iron Age fort and Roman, Saxon and Viking settlement. Artefacts found on the site from these periods support this belief. In 1066 the site was attacked by the Normans and Robert Gernon, the Duke of Boulogne, built his castle here, making it his chief seat and the head of his Barony. There is some evidence that Robert Gernon was a close relative of William the Conqueror. Robert Gernon (or Robert Greno as he is referred to in the Domesday Book) came over from France with William the Conqueror, and was rewarded with this Lordship and several others in the County.The male line of the Gernon family continued for only five generations. The time of Robert Gernon’s death is unknown. William, his son and heir, dropped the name of Gernon and took the name of Montfitchet, which was used thereafter by his descendants. William founded the Abbey of Stratford Langthorne in West Ham. Of William’s son, Gilbert de Montfitchet, little is known. Gilbert’s son, Richard, held the office of Forester or Keeper of the Forests of Essex, with the custody of the King’s House at Havering and other houses in the Forest, given to him by King Henry II. In 1203, Richard died, leaving his son Richard II a minor. He became a royal ward of King John and was placed in the care of Roger de Lacey, Constable of Chester and, subsequently in 1211, became a ward of his mother. As soon as he became of age (the exact date is unknown), Richard de Montfitchet II seems to have joined the Baronial opposition to the King. His motives and the order of events are both obscure. The opposition to King John seems to have begun with a number of north country Barons who “then made common cause with a group of magnates, drawn together by family ties or by private or public grievances, whose sphere of influence was chiefly centred in Essex”. These disaffected Barons include the son of Richard’s former guardian, two brothers-in-law and a cousin which would give some reason for young Montfitchet being drawn to this group. But King John was swift to react when it was in his power to do so. Two of the rebel leaders, Eustace and Fitzwalter, were in 1212 found guilty of treasonable designs and outlawed. 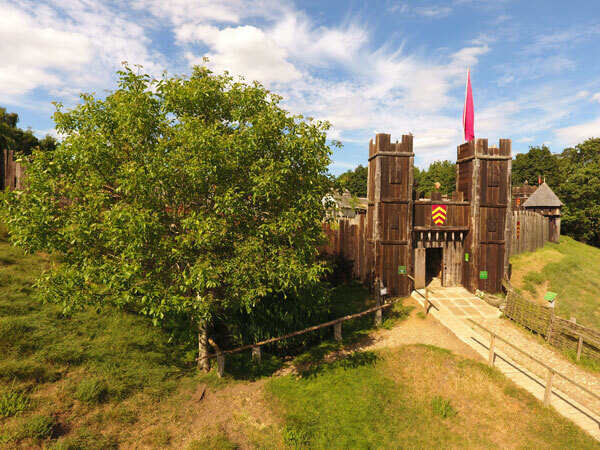 King John followed this up by destroying as many of his opponents’ castles as he could and Mountfitchet Castle seems to be one of these. When the Barons gained their seeming victory at Runnymede in 1215, Richard de Montfitchet II, in spite of his youth, was one of twenty-five Barons chosen to enforce the observance of Magna Carta. 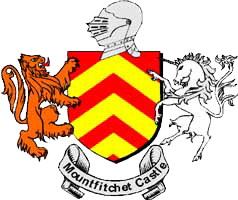 Henry Laver in his article on The Castle at Stanstead Mountfitchet describes Richard de Montfitchet II as the youngest, yet one of the three bravest Knights in England. Richard died in 1258, having regained royal favour under Henry III, who restored all his estates, but he lacked heirs as he apparently never married and the Montfitchet possessions were divided among his three sisters, thus bringing an end to the reign of the Montfitchets. 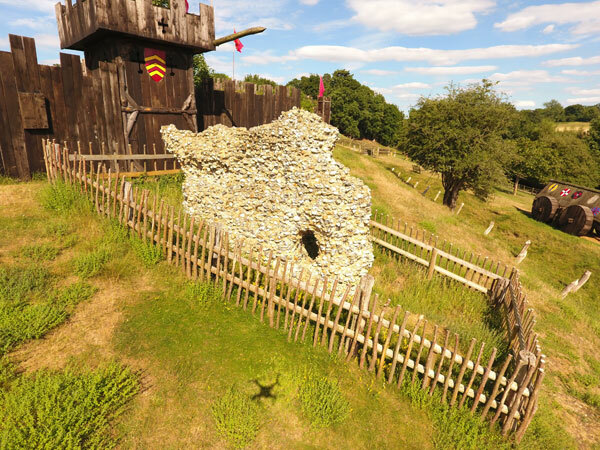 After the attack on the Castle around 1215 by King John, the stones were taken by the villagers to build their houses and the castle site lay overgrown and forgotten for over 700 years until its re-construction today.